In my 62nd year, I have successfully completed my first art show. Not without bumps and bruises, but on the whole, speaking from the downhill side, a positive experience. I've always steered clear of such affairs - really, how could anyone sit in a tent for three days watching people pass by smiling politely not buying anything? And the volumes of inventory one must stockpile for these events! But this one, the Sun Circle Art Show, was only one day, during the civilized hours of 11 to 5, in the equally civilized neighborhood of Sapphire Shores just south of the museum, so I thought I'd give it a try. I browsed the web for cheap tents, but my dear brother John said "Wait! I have an extra one! I'll bring it over! I'm retired - what else do I have to do?" So he drove over the night before from Coral Springs with his tent and his Dolphins folding chair (no stranger to tailgates). 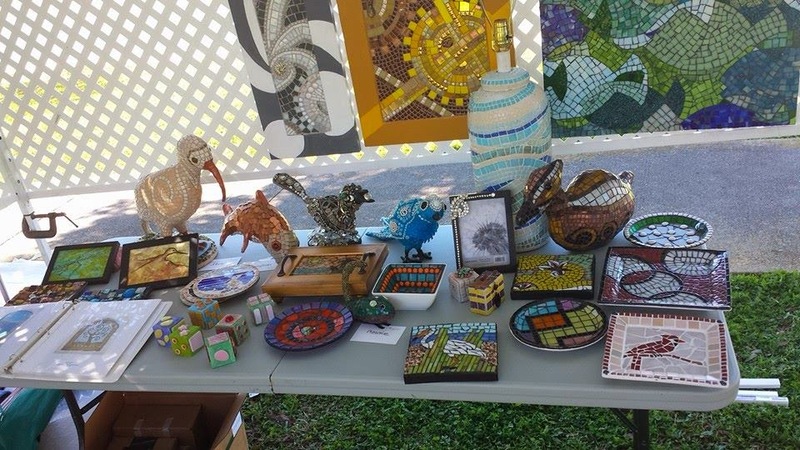 Meanwhile I printed up cards and bought lattice panels and zip-ties and bubble wrap and price stickers and feverishly mosaicked and grouted and borrowed work from the various galleries around town that show my work and managed to collect a tent's worth of stuff. I was surprised, seeing it all together, at how much there actually was. I guess when it's dispersed among galleries and my classroom and my living room and studio it didn't seem like so much. The eye-opener for me, and what will probably motivate me to do this again, despite the effort, is that I was able to see a little of what other people see; in other words, what attracts the eye, much more clearly than just hanging work in galleries or posting to a website. The personal connections are part of the sale, after all. And I did make a few sales - which didn't hurt either!